Yay! My very first journal article is now out on the Zeitschrift für die alttestamentliche Wissenschaft (ZAW) website (Germany-based). A four-page preview is available on my academia.edu. If you do not have the subscription or institutional access to this journal, you are very welcome to message me for an e-offprint (lydia.lee.siqi@gmail.com). Hope you enjoy reading this article! Ezekiel 25:12-17 depicts one conflict zone peppered with violence and bloodshed, where Edom and Philistia took bitter vengeance against the house of Judah, and in turn incurred the divine retaliations. This essay argues that the oracles against Edom and Philistia in Ezekiel 25:12-17 contain highly significant semantic parallels with other biblical texts narrating the divine judgment executed against Jerusalem. Utilizing those semantic parallels in the literary context of Ezekiel 25:12-17, the oracles against Edom and Philistia create a radical rhetorical impact, such that the house of Judah, though victimized, is not compensated materially. Instead, the oracles peculiarly form an oblique rhetoric, affirming not only the dispossession of belligerent Edom and Philistia, but also that of Judah. Look, my name is finally printed on an academic journal! This is the history of the foreign nations that the students have reconstructed 🙂 In hindsight, I realize that I should have cut the pieces of papers in a bigger size, so that the words on the paper could be more clearly seen. Anyway, we were a small tutorial, so I ended up gathering the students around me and explained the history to them. Just focus on the bubbles and the branches on the board. They are a summary of the grammatical parts of a Hebrew verb and a Hebrew noun. Please disregard the boxes and other hebrew words, which were some stuff I wrote to explain the Tyre oracles. Having done the parsing of several difficult words, we then sat close together and translated the selected Hebrew passages. Taking turn, each of us read and translated the Hebrew verses. The students were allowed to translate the passages into German or English. Sometimes, just for fun, some students even offered a particular translation in either French or Chinese. Isn’t it interesting that the bible can be translated into so many modern languages?! 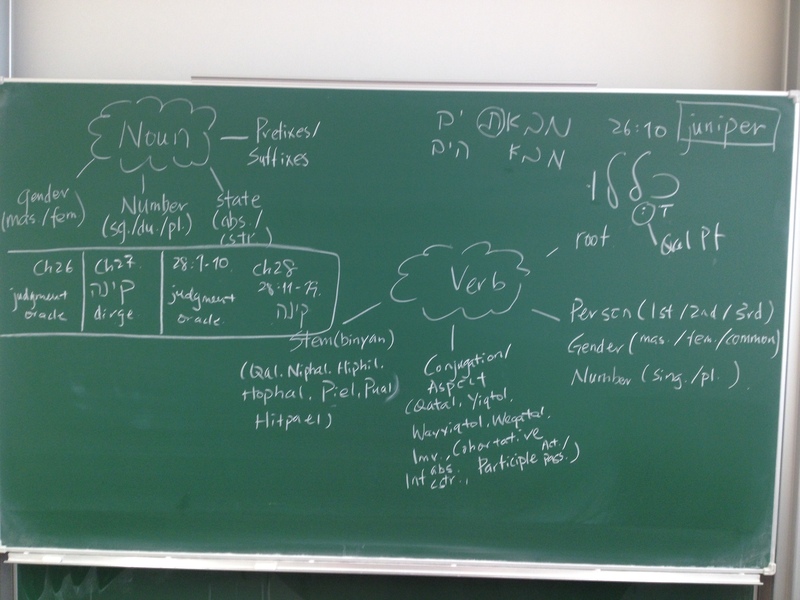 The tricky part was to explain the many peculiarities and irregularities in the Hebrew texts. Once, we encountered a Hebrew word that could have three different basic meanings. At another time, we bumped into one term that provided gaps for other textual emendations. From the literary contexts of the target passages, we had to explore, examine and work out the validity of various translations. The biblical texts kept propelling both the students and me to move beyond our own experiences and limitations, and introduced us to a larger world of knowledge. The two scenes in the movie gave an interesting rendition of Ezekiel 25:17. 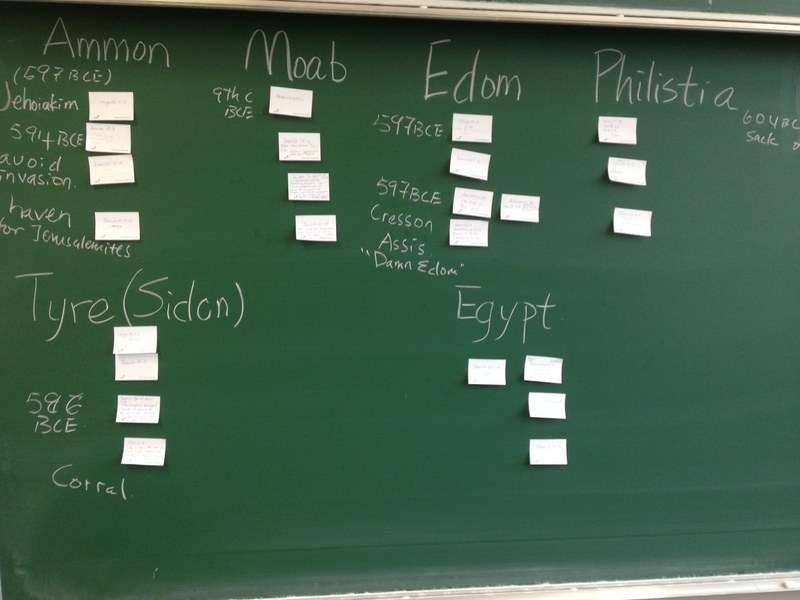 We attempted to compare and contrast the biblical and the cinematographic renditions of Ezekiel 25:17. The adrenaline-filled scenes, I think, gave just enough doses of stimulants to make us reflect on the message embedded in Ezekiel 25 more deeply. Just before the winter break, we even held a Christmas quiz, going through what we had learned in the semester so far through Q&A! At the beginning of the semester, I was riddled with fear and uncertainties about my upcoming live encounter with the students. ‘What if there are not enough students?’ ‘What if I stutter so often that the students can’t understand the message that I’m trying to convey?’ ‘What if my questions are met with a stony silence?’ There were a lot of ‘what ifs’ swimming through my mind. As the semester unfolds, the passion for the subject of study and the encouragement from a few students seem to dissolve my fear bits by bits. And of course, there’re still 5 more weeks to go, let us then be patient toward the unsolved and gradually live into the answer. 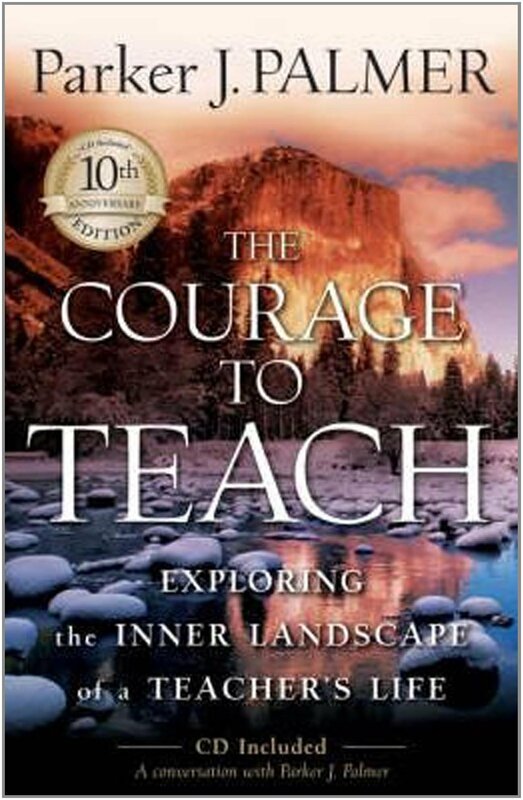 I am really grateful for my senior pastor’s recommendation of this book titled The Courage to Teach:Exploring the Inner Landscape of a Teacher’s Life by Parker J. Palmer, which helps me reflect on my teaching experience. I bought the electronic version of the book, and the normal cover of the book is displayed on the right. In the first part of the book (chapters 1-3), Palmer stresses that our obsession with teaching technique, objective knowledge and the powers of intellect must also be balanced by a focus on the teacher’s self-knowledge, subjective engagement and the powers of emotions. The second part of the book (chapters 4-6) goes on to explore ways for teachers to relate and connect with the community in education. What I really like is his citation from Robert Frost’s poetry: ‘We dance around in a ring and suppose,/But the Secret sits in the middle and knows.’ It helps to paint an imgery of the kind of classroom I want to be in. It reminds me that I am like the students, in that we are all seekers, sitting in a ring, and striving very hard to approach the Secret/the Subject of Study that ‘sits in the middle and knows’. Announcement: Saying Hello to a New Semester! 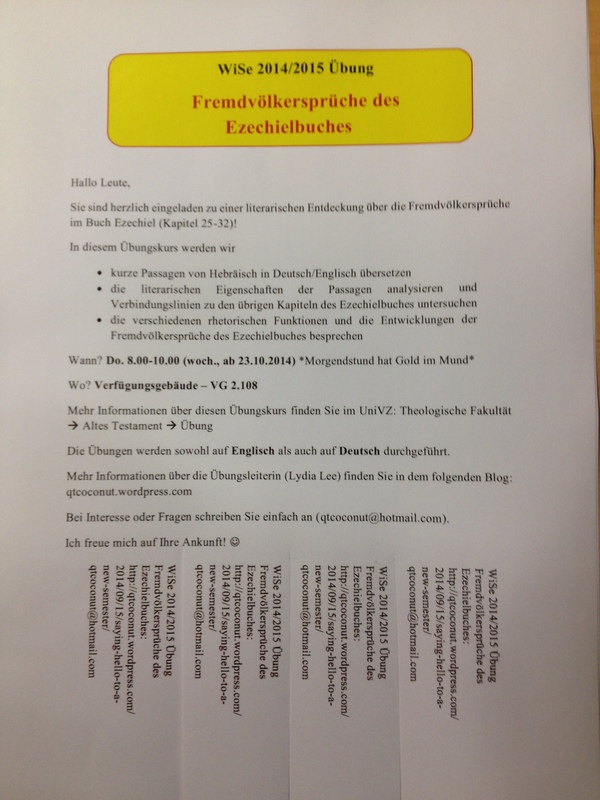 To all students at the University of Göttingen, I volunteer to teach Ezekiel’s Oracles against the Nations (chapters 25-32) in this coming semester (WiSe 2014/2015). For more details, you can check out this link on UniVZ. So I’m going to do a bit of promotion about this course. This promotion is also to assure you that die Übungsleiterin is NOT an alien monster, a runaway fugitive or a bloody murderer. In what follows, I will introduce myself and the genesis of my interest in Ezekiel’s Oracles against the Nations. This introduction is going to act like a CV, except that it is going to be in the form of a narrative, and except that it is going to be very long, like in a series! 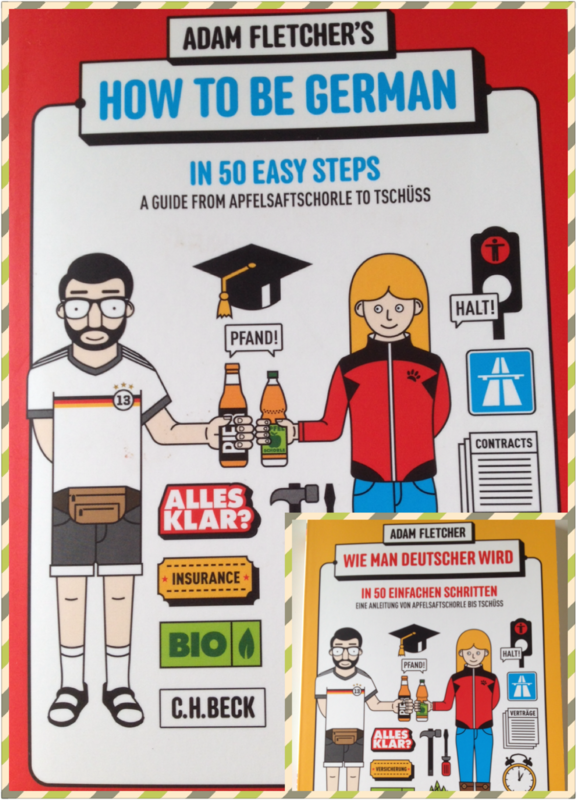 Anyway, Adam Fletcher’s hilarious How to be German/Wie Man Deutscher wird has already told us, a German CV has to be “a giant document, death by minutiae.” I am just trying to fit into this flow of German tradition. 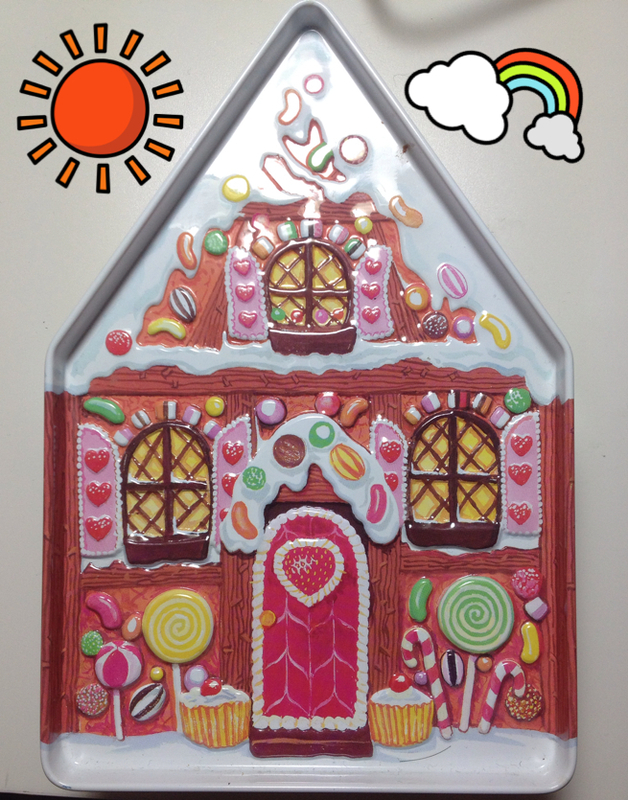 A fun little book that is one of the “Spiegel” bestsellers. “Sorry,” I will stare at you puzzlingly. “I don’t understand your question. What does objectivity really mean to you?” Once I watched a BBC programme about interior design. Depending on the colour, lighting, texture, pattern and furniture arrangement in a single room, our eyes can actually be brought to perceive the dimensions of the same room in different terms. In an analogous way, depending on our external experience and lived environments, we are disposed to perceive the biblical texts in different ways. The way we gather the textual evidence and the way we make up a set of criteria to evaluate our evidence all reflect subjectivity. What makes true scholars different from the other amateurs, in my opinion, is their willingness to explore, gather, discuss, argue and criticise the opinions of the others or even of themselves. That means, a scholar’s work represents not a total objectivity but rather a more informed subjectivity. To say one’s position as totally devoid of personal Tendenz, it seems to me, is a rather presumptive claim. So, if you are interested in my viewpoint on Ezekiel 25-32, why don’t you spend some time to get to know the behind-the-scene stories? I will try to be transparent and honest as much as possible. Hopefully I can show you why I just can’t get enough of Ezekiel 25-32, even after four and a half years since I have written down my doctoral research proposal. This is also a reply to all those people I have kept bumping into in the previous years, who have remarked: Why can’t you just focus on the famous visions of Ezekiel? How do the Oracles against Nations have to do with anything? Just one more thing about the structure of the following series. The reason that I am drawn to Ezekiel’s Oracles against the Nations is due to the fascinating concept of “nations.” My perspectives to the texts are indelibly shaped by my study and living experience in several nations that I have stayed in for a relatively longer period (at least for more than six months). In what follows, I will divide and categorize my stories chronologically, covering Malaysia, Australia, Israel/Middle East and Germany. Just bear in mind, I am not going to tackle the comprehensive history of each nation, which belongs to the task of professional historians. Even though some “official” historical events might shed light on my experience, the stories predominantly remain my own first-hand encounters and reflections. A few months after my 26th birthday, I finally submitted my updated dissertation, which now covers roughly 300 pages (I really have to add that this was one of the birthdays, when I, being left alone in Germany, missed my family in Australia and my fiance in China the most). Well, PhD is really harder than I thought. In Germany, one cannot get a real doctoral title until the dissertation is formally published. But at least I have made the first huge step by submitting it! Now, I would like to invite you to the defense of my dissertation, which is about Ezekiel’s Oracles against the Foreign Nations (chapters 25-32).